Commissioned in the Marine Corps in 1943 flying 59 combat missions in the Pacific Theater during World War II. From June 1948 to December 1950, instructor in advanced flight training at Corpus Christi, Texas. From 1951-1953 flew 90 combat missions in the Korean conflict. Attended Test Pilot School at the Naval Air Test Center, Patuxent River, Maryland. From November 1956 until selection by NASA, assigned to the Fighter Design Branch of the Navy Bureau of Aeronautics in Washington, D.C. In July 1957, set a transcontinental speed record, flying from Los Angeles to New York in 3 hours 23 minutes. 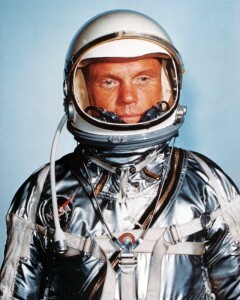 February 20, 1962, became the first American to orbit the earth aboard the Mercury Spacecraft Friendship 7. He completed 3 orbits in 4 hours 55 minutes. After leaving NASA entered private industry until elected to the United States Senate from Ohio in 1974. During his tenure in the Senate he made one unsuccessful bid for the Democratic Presidential nomination. 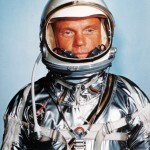 From October 29 to November 7, 1998, John Glenn flew as a payload specialist aboard Discovery, participating in experiments concerning the effects of weightlessness on the aged. 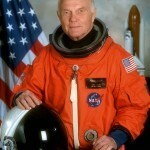 He became the oldest person to enter space at the age of 77 years 3 months. Retired from the US Senate in January 1999. Author of “John Glenn: A Memoir”, 1999.